Brooke Dalton (Alice Eve) desperately needs to catch the 1.30am train out of New York to Boston. However, running full pelt on her way to Grand Central Station, she is robbed. Frantic, she bumps into musician, Nick Vaughan (Chris Evans). He offers to help her get back to her life in Boston, sparking a nighttime adventure through New York City. Having loved Chris Evans in this summer’s Captain America: Civil War, I was interested to discover that he had directed a film. Released in 2014, Before We Go is about as far from the world of The Avengers as you could possibly get. This romantic indie film tells a story of chance meetings, broken hearts and inconvenient love - set against a stunning (thanks to cinematographer, John Guleserian) backdrop - the City of New York. 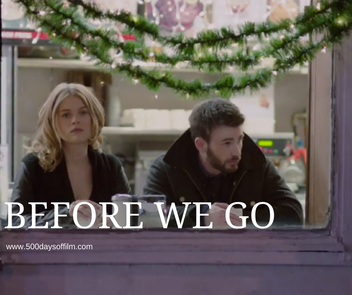 Before We Go looks gorgeous, features charismatic leads and is nicely directed by Evans. Unfortunately, the film suffers from a unconvincing storyline which prevents its characters from developing any real interest or chemistry. Meanwhile, the film’s title (and decision to include a couple walking and talking around a city all night) evokes the mighty shadow of Richard Linklater’s Before Sunrise. Evans’ film just cannot withstand the comparison. Have you seen Before We Go? If so, what did you think of this film? Let me know! Leave me a comment in the box below! Hi Josephine, so glad that you loved this movie. It is great to see Chris Evans in a different, non-Avengers role and I am really looking forward to seeing what he directs next!